For those of you who aren’t familiar with X, also known as X/1999– yes, it’s an old series. And yes, it has been on hiatus for over ten years, and will very likely never get a proper ending (in the manga, at least). With that said, it is still a series I would genuinely recommend, and recommend over other series like Angel Sanctuary, which may look similar at first glance. Kamui Shiro is a young man who was born with the power to decide the fate of the Earth itself–a destiny he can barely bring himself to believe. But as other players in the prophecy begin to gather around him–the “Seven Seals,” with the power to protect the Earth, and the “Seven Harbingers,” who are fated to destroy it–he has no choice but to come to terms with his fate. As well as epic visions of the world’s destruction via dragons, or actual images of Tokyo turned into a wasteland with nothing but Tokyo Tower and the Japanese Diet Building remaining. The repeated dreams and apocalyptic setting allows for some truly amazing art. The only downside to it is that there are a lot of characters, following the theme of the seven Dragons of Earth and seven Dragons of Heaven, and sometimes these characters can be hard to tell apart from one another. The men especially can be confusing. With that said, however, each character has a very distinct personality and backstory, and once you figure out who’s who it’s not too hard to distinguish them by behavior and actions (though you may well be halfway into the series before you really have a good grasp on everyone’s personality). I’ll be honest with you – the story of X is a chaotic mess. People die left and right, there are dreams within dreams and increasingly bloody imagery of people shattering, the earth shattering, dragons and winged Kamuis, but to quote Shakespeare: there is method in this madness. Unlike Evangelion, in which much of the Christian imagery and motifs had, quoth the creators “no actual Christian meaning to the show, we just thought the visual symbols of Christianity look cool” (source: EvaOtaku FAQ), dreamseeing and fate is a heavy theme in X. The dreams are not at all random, and dream sequences from volume 1 may actually come true in volume 10, or reflect metaphorically events that happen much later down the line (as many of the dreams tend to be metaphorical). 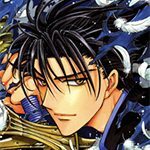 I disagree with those who think X is stalled because CLAMP couldn’t decide on an ending – rather, I’m fairly sure the ending has been decided since the very beginning, and the only question is whether they’re still willing to draw it. 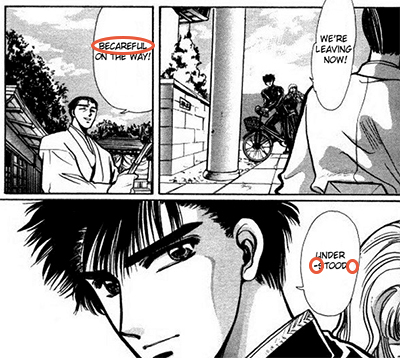 CLAMP has done their homework. Is everything still messy and at times confusing? Yes. The beginning especially can be a bit slow to get into as many different characters are introduced and as I mentioned above some of them also look like each other. A good translation really makes a difference here, and I strongly recommend the Viz omnibus translation over the original print from 2002 (see Scanlation section for more details). Once the gears start turning, however, the story has a mysterious allure that draws you in and sends readers tumbling uncontrollably towards the inevitable Day of Judgment despite its flaws. Even the initial exposition I don’t really find to be a con, because once you get into the story you’ll appreciate the work that went into the characters. With over a dozen of them many characters don’t get much screen time, but the small snapshots you do see of them are enough to illustrate their own personal upbringing and behavior as an unique individual, and the stories are actually interesting. For all of them. X also isn’t as angsty as you might think. To clarify, yes it’s definitely a dark series, and yes we have considerable angst when people die, horrible things happen, people get overtaken by their darker desires… etc. etc., but it never feels tiring. If you watched Evangelion or even Code Geass, you might know what I mean. It can be mentally exhausting just to follow the characters through their tragedies, but X balances its angst out with action, dialogue, and accelerating plot, so while there is angst within the story, it never feels like you are mired in it and can’t get out. I’ve said a fair bit about characters above, and I won’t repeat it again but tl;dr the characters are unique and interesting despite there being so many. CLAMP does have a habit of cameo-s from their old series, so you will see some characters from CLAMP School Detectives pop up which can seem random and a bit out of context if you aren’t familiar with that series. Characters from Tokyo Babylon also appear here, but enough information is given about their backstory that it won’t matter even if you’ve never read Tokyo Babylon before. Main character of the series. 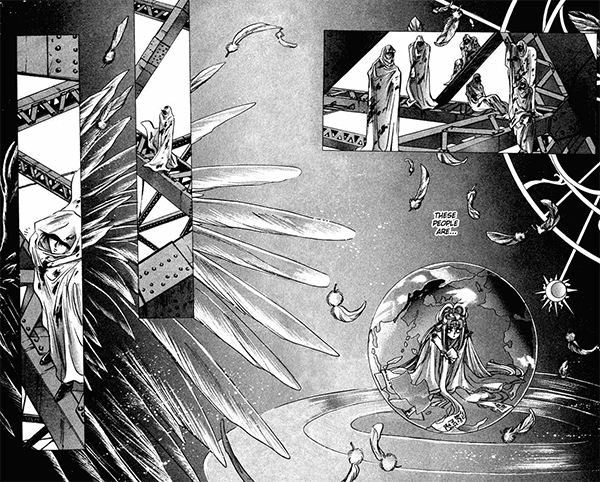 The fated Christ-figure prophesied to bring about the apocalypse, with a name that can either mean “the one that represents the majesty of god” or “the one that hunts the majesty of god.” This duality is expressed as the choice Kamui can make to side with the Dragons of Heaven or Earth, and it is prophesied that his choice will greatly affect the fate of the planet. He is childhood friends with the Monou family, but moved away abruptly 6 years ago. 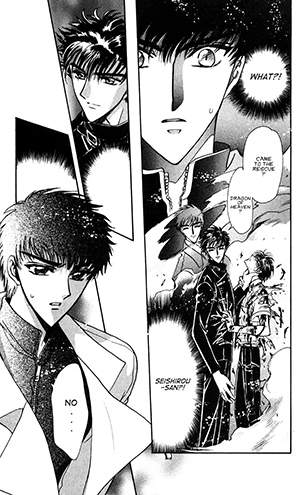 Kamui’s closest friend from his childhood and the older brother of Kotori. He is shown as a dedicated older brother and son, taking good care of his sister and shouldering much of the responsibility for the Monou family after his mother’s death. Shown to be a serious, dependable character who is well-liked by those around him. A sweet girl who loves animals and feels deeply for other living beings. She is Fuuma’s younger sister and Kamui’s childhood sweetheart. Both Kamui and Fuuma appear to care for her deeply. Also known as “The Seven Seals,” these are individuals that seek to defend the earth and preserve the current state of affairs. 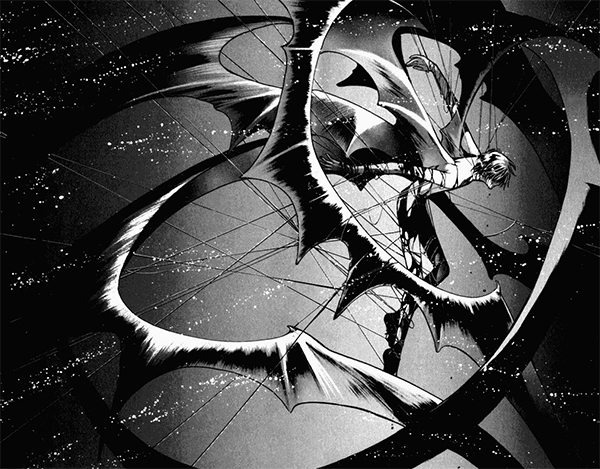 Each of the Dragons of Heaven have the ability to create a “spirit barrier” (sometimes referred to as kekkai) which will protect the earth as long as they themselves are not injured or killed. Also known as “The Seven Angels,” “The Seven Harbingers,” or sometimes “The Seven Minions,” these are individuals that seek to bring about revolution by destroying mankind and man-made structures so that the earth can recover from the environmental damage it has suffered. The whole series was scanlated by Be With You Scans from 2005 – 2007, and as much as I hate to say it, the quality of the translations and editing work are really not that great, even though the scans themselves are decent. Later volumes do get better, but BWYS never went back and upgraded the old work since X was licensed by Viz. Band of the Hawks (now defunct) did in fact do some volumes with pretty decent quality, but due to differences in translation this means that key names/conventions may change from volume to volume depending on whose version was uploaded, which really mars the experience. Then what about Viz? Sadly, the initial Viz release is also not great. The translation has its own minor issues (though it’s at least consistent), but unfortunately Viz made the decision to flip all of the images to suit Western readers. It’s a full flip (where they flip the entire page) rather than panel-by-panel, and none of the characters in X have super distinguishing scars or one-sided features (a la Kenshin) that would swap sides, but it does mean that all right-handed weaponry are now switched to left hand, and vice versa. And if you’re used to reading right-to-left, it can just be plain weird. WITH that said, I do highly recommend the new Viz omnibus 3-in-1 edition released by Viz in 2011, titled “X” rather than “X/1999”. This version is unflipped and includes some beautiful color spreads that were not included in the original English print, as well as some improvements to the original Viz translation. 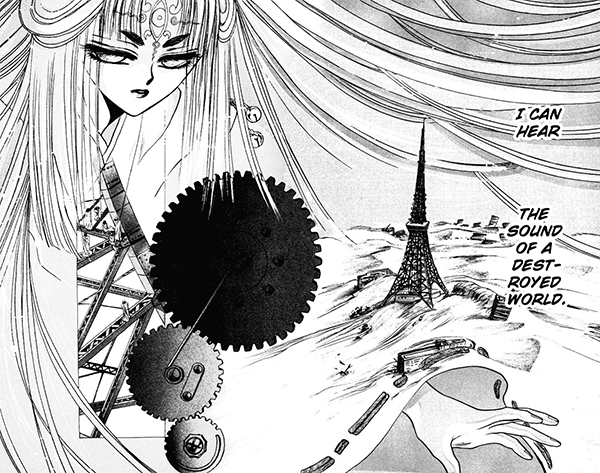 Of CLAMP’s works, Tokyo Babylon serves as a semi-prequel to X, telling the backstory of Subaru Sumeragi and Seishirou Sakurazuka while being an independent story in its own right. Aside from that, RG Veda is probably the closest in art and tone, with Shirahime-Syo: Snow Goddess Tales at a close second. If you liked the concept of the yin/yang dual protagonists and the struggle to determine right from wrong, I strongly recommend Code Geass the anime. Lelouch and Suzaku are perfect examples of this all the way up until the end, and Code Geass has an excellent ending while X remains inconclusive. The Dark Knight (batman film) is also a good exploration of the concept of duality within a person. I also recommend reading Devilman if you don’t mind older art styles. 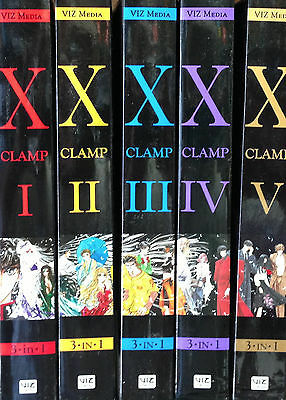 This series was a major inspiration for CLAMP in creating X, and if you read it you’ll see why. Now if you’re just looking for general takes on apocalyptic and/or post-apocalyptic stories, 7 Seeds is one of the best post-apocalyptic survival stories I have ever read, and Miyazaki’s Nausicaa of the Valley of Wind is another wonderful take on the end of the world, with more of a focus on the environmentalist perspective. Note that for Nausicaa, while the anime is good, I recommend the manga over the anime as the anime only covers about half of the full story. Neon Genesis Evangelion is also about the end of the world, but with a lot less environmental and moral questions and a lot more fucked up characters, and tends to be a lot more depressing than any of the recommendations so far. Both anime and Sadamoto Yoshiyuki adaptation are good. I have to say, as much as I hate being left hanging, I also don’t mind being left hanging. 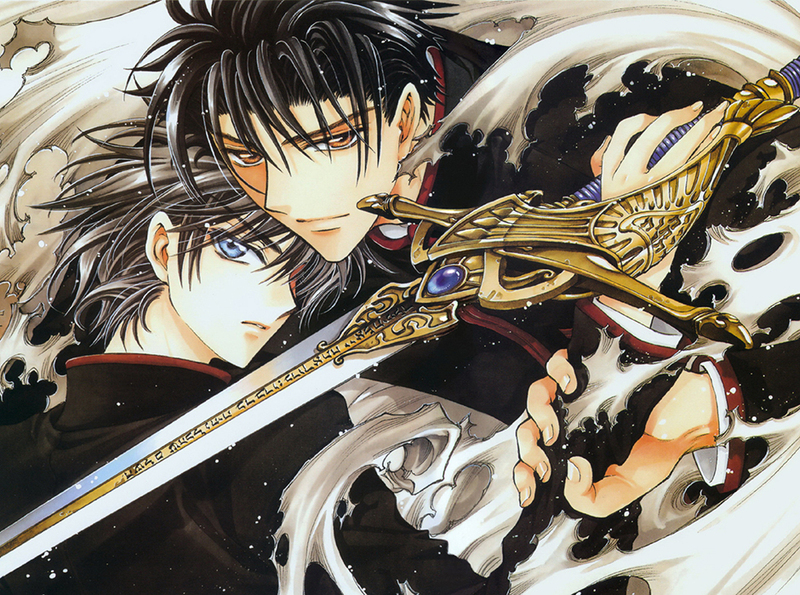 Probably because Clamp generally has the habit of deciding the end in the beginning and everything has been “foreordained”. There aren’t that many wild interpretations that you can conjure so it’s pretty clean even though conspiracy theories are so much fun. I agree that X1999 is wonderful to read if anyone enjoys mind-fuckery about contradictions of a heart’s longing, a wish or a true desire. Basically you can be everything and be hypocrite or choose to be nothing and also be a hypocrite (lmao). Also I’m gonna take up on your advice to get the omnibus editions because the scans were a pain to decipher as to what was actually being implied. Though the manga has some elements that neither the film, nor the TV series had adapted, each is treated more or less as its own interpretation of events, especially when it comes to how each adaptation ends. Hokusai x Manga traces the influence of popular Japanese visual art, from the h century forward, on contemporary manga.